Amino AcidsScitec AAKG - 100 kaps. Scitec AAKG - 100 kaps. 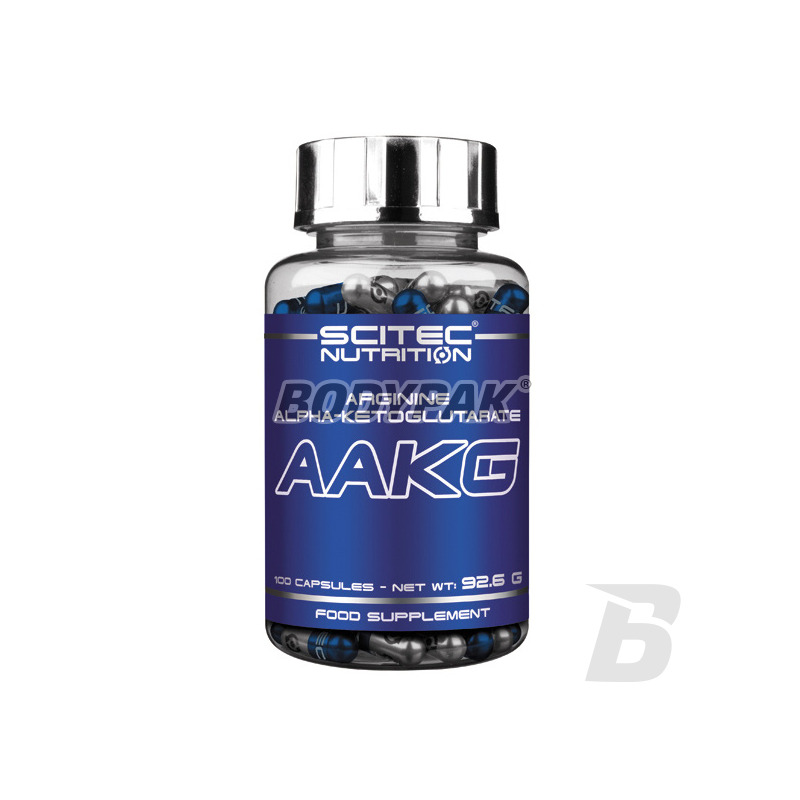 Scitec AAKG - the alpha-ketoglutarate arginine is an advanced form of the amino acid arginine, as it is associated with alpha-ketoglutarate, which is a key mediator in the Krebs cycle energy, and amino acid metabolism. Scitec Nutrition AAKG - the alpha-ketoglutarate arginine is an advanced form of the amino acid arginine, as it is associated with alpha-ketoglutarate, which is a key mediator in the Krebs cycle energy, and amino acid metabolism. 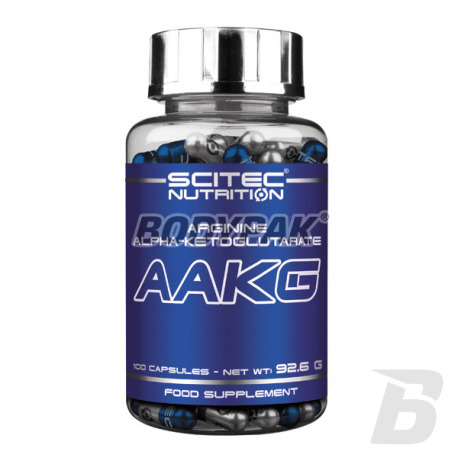 Scitec Nutrition AAKG unlike other AAKG effective in the standard dose, which is the one portion. Why? Because the molecular level has a high pharmaceutical purity of the compound, its quality. Scitec provides the highest purity supplements on the market, so there is no need for reproduction portion in order to achieve the desired result. Arginine also influences the secretion of growth hormone promotes regeneration of liver and is a major precursor of creatine. Unfortunately, the traditional form of arginine easily disintegrates in the stomach and the same small amount reaches the destination. To prevent Scitec Nutrition AAKG contains arginine alpha-ketoglutarate. Alpha ketoglutarate arginine increases the amount of nitric oxide to help in training, increased vascularity, and provides a maximum dose of oxygen. AAKG supports the production of growth hormone and insulin secretion resulting in anabolic effects. Arginine increases the amount of nitric oxide, a vasodilator helping strenuous exercise, increased vascularity, and can also increase the amount of oxygen in the heart and other muscles. AAKG is involved in the formation of nitric oxide and thus has the ability to expand the blood vessels, allowing for better blood circulation in the muscles and soft tissues. Indirectly involved in the synthesis of cGMP which, together with ATP is involved in muscle contraction and has an anabolic effect. Use one serving 30 minutes before workout and half a serving (2 caps.) Before bedtime. Jedne z lepszych aakg jakie "jadlem"
Bardzo dobra pompa mięśniowa, ukrwienie uległo zdecydowanej poprawie! Biorę od miesiąca z BCAA przed treningiem, wyraźnie zwiększa wytrzymałość i siłę. Świetny produkt jak i producent. Postanowiłem przetestować osobiście i mogę śmiało napisać że to dobry towar.Działa bez zastrzeżeń a dawki nawet ciut mniejsze niż naszej krajowej firmy której brałem do tej pory.